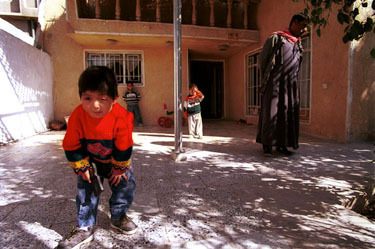 It has been estimated that there is over 300 tons of depleted uranium that has seeped into Iraqs ecosystem. 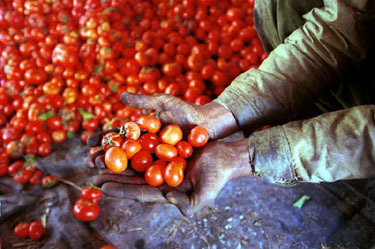 This region also produces most of Iraqs tomatoes and cucumbers. No one knows what the long term effects of DU will be on the environment and food chain. My guide Samir was always present while I was working. However, except for a few exceptions, I was permitted to photograph and work as I wished. as were military bases which were surprisingly less apparent than I expected. Paradoxically, back in Baghdad when I wanted to photograph a poor neighborhood and some beggars, I was not allowed. I explained that I was merely trying to show how the sanctions were hurting the Iraqi economy and Iraqi citizens. I would have thought that this would fit right into Saddams propaganda scheme, however my guide said that I wasnt to take photos that offend the dignity of the Iraqi people. It seems Iraqi pride is stronger than the will to manipulate information. In light of the many unanswered questions about depleted uranium and the perception that anything that comes out of Iraq is fabricated propaganda, I didnt want the validity of this story to rely on statistics that could be put into doubt. I had also had my fill of hospitals. I began to look for unusual cases or cancer clustering that would clearly point to something out of the ordinary and might visually link these maladies to depleted uranium. Among others, I found the extended family of Mohammed Yasin Essa. This was the only time during my stay in Iraq that I was threatened.